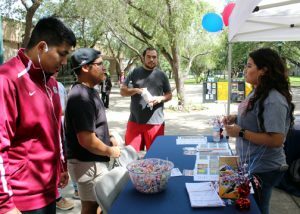 (HARLINGEN) – Amanda Jimenez, 21, registered to vote this week for only the second time since her eighteenth birthday because of the encouragement she received from student leaders at Texas State Technical College during an event for National Voter Registration Day. Jimenez said she will exercise her right to vote in the upcoming midterm elections on November 6. There are more than 20 TSTC student leaders from campus organizations such as Student Government Association, TSTC Service Squad and TSTC Leadership Academy, who have completed the required country training to become Volunteer Deputy Registrars for the state of Texas. Volunteer Deputy Registrars are trained to officially register voters in the state of Texas . They are appointed by the county voter registrars and charged with helping increase voter registration in the state. TSTC Student Orientation and Activities Coordinator Larissa Moreno said this project is part of many civic engagement and community service projects the students participate in. Increasing student voter registration has been an initiative set in place by TSTC and its student leaders for at least a decade. Moreno said every student appointed as a Volunteer Deputy Registrar has been well educated and trained on voter registration, the voting process and political race and candidate information. As Volunteer Deputy Registrars, the students are able to help with voter registration across the state. Iris Juarez, TSTC Business Management Technology graduate, returned this semester to complete her Academic Core and took on the lead role in this initiative. TSTC partnered with the Advocacy Alliance Center of Texas (AACT), a non-profit, nonpartisan entity that serves as a uniting “table” for all nonpartisan, charitable voter registration turnout efforts in the community, since South Texas sits below the state average for voter turnout. According to AACT, six out of 10 people in Texas vote, but in the Rio Grande Valley only two out of 10 people exercise their right to vote. TSTC’s voter registration initiative is year-round and, for students, it begins during their New Student Orientation. The students so far have registered more than 200 people. Voter registration at TSTC is open to faculty, staff, students and the Cameron County community. The last day to register to vote is October 6, early voting at TSTC is October 22-26 in the Student Center VIP Room from 9 a.m. to 6 p.m.
To register to vote or for more information on voter registration, call 956-364-4117. This entry was posted in Harlingen on October 1, 2018 by Amanda Sotelo Sotelo.